Awesome! Just had chicken soup two nights ago… wanted extra veg so also added some leeks with the other veg and mushrooms for the last 10 minutes of boiling. Also added parsley, sage & thyme. Ate with white rice, lime juice, and sriracha! My mother taught me to boil the chicken with a peeled turnip, and onion, a whole stalk of celery and a large carrot. Then, after an hour or so of simmering, take out the veggies and throw them away. Take out the chicken and let it cool. Skim fat off the broth. Meanwhile chop your fresh veggies and put them in the broth to cook. 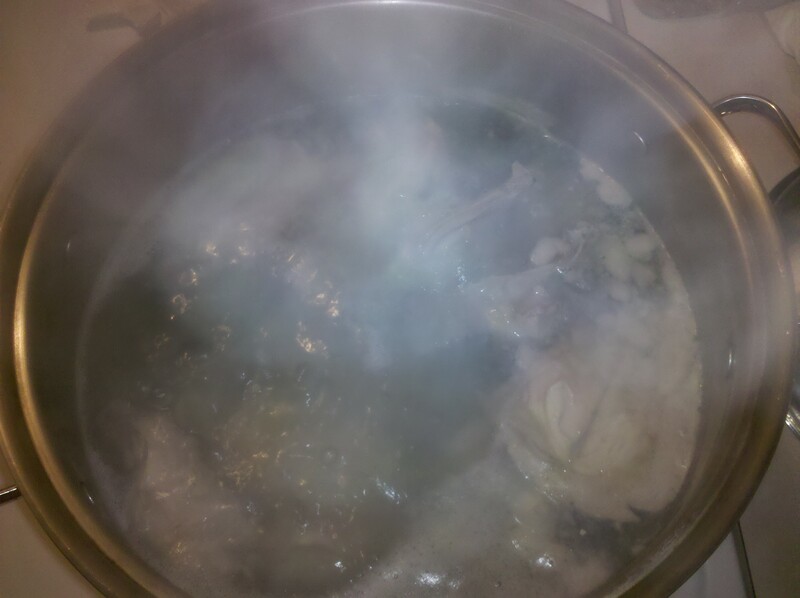 When they are close to done, skin and de-bone the cold chicken and put the chopped up chicken pieces into the soup. This way the stock is nice and strong, and has the nice flavor of the skin and bones, while the meat is not over-done. I usually put some noodles in about the same time as the chicken. Rick, your mother’s soup sounds delicious! I will have to try it next time! Thanks for the detailed tips!